I’ve recently returned home from my study abroad experience in Italy and I wanted to share what I loved about the city and maybe what others could avoid! A majority of my time was spent on our campus in Cortona, but we went to Rome twice and Rome is definitely NOT overrated. I have way more Do’s to share than Don’ts because it’s an amazing city with so much to see and do. Do: See the monuments! If you’re like me, you’re not going to be going to Italy very many times in your life; experience it! While the monuments are crowded and have long lines, they’re monuments for a reason. They’re breathtaking. Every single sight was one of those things in life that makes you feel very small in a big world. The major spots include: the Colosseum, Trevi Fountain, Roman Forum, Vatican, Pantheon, Piazza Navona, Piazza di Spagna, and Piazza del Popolo. Don’t: Get sucked in the tourist restaurants, like in Piazza Navona. We were exploring Piazza Navona around dinner time, which was maybe a mistake. We were constantly bombarded by servers that have to stand outside the restaurant and entice customers in. These restaurants are all very similar, pretty cheap and don’t have the best service in the world. I wouldn’t say we had a bad experience at all, but you could tell it was a tourist trap and I think we could’ve found something more authentic! Do: Wear sunscreen and comfy shoes. I got very sunburnt by just walking around the city all day, LOL. I’m pretty pale, but I know I’m not the only one! I also underestimated the amount of walking we’d be doing, so I went for the cute shoes instead of sensible. I ended up with tons of blisters and a whole lot of pain! I recommend grabbing some Birkenstocks or good, Italian-made sandals as a souvenir! Don’t: Try to walk the entire city. Rome is a massive city; don’t try to walk it. One day, we walked 12 miles and only saw a fraction of the city. I recommend tackling it by region, instead of hopping around too much! All it takes is just a little planning of where you want to go and your time schedule! I included the map to the left, just to demonstrate how something may not seem that far on Google Maps, but it’s actually a good distance away. Do: Take the metro! We bought the Roma Pass, which included 3 days of public transportation use. To me, the bus system seemed okay for short distances, but for a brand new tourist, it seemed pretty confusing. The metro was extremely easy to figure out and use thought and I definitely recommend! It was faster than the buses, as well. They only have two main lines that basically hit all of the main spots! Don’t: Be careless with your belongings, but don’t give yourself too much anxiety over pickpockets either. Before our trip, I felt like I was in a reverse episode of Beyond Scared Straight. They warned us about pickpocketing so much that I was terrified that every single person in the entire country of Italy was out to rob me. While I know pickpocketing is SUPER common, they had us thinking that it happened at every turn and if you people-watched for a few minutes, you could see it happen. This didn’t happen. While I did buy some RFID sleeves for my cards and I wore a cross body purse, neither I nor anyone on my trip was pickpocketed. Don’t be stupid with your belongings, but I do genuinely think that it’s not aaaassssssss bad as they say. Or maybe I just got lucky; I don’t know. Do: Visit an art gallery or museum! We were on a study abroad trip, so naturally we were going to museums left and right. I’m not super into art history, but I’m glad I got to see some important historical works in the place that they were created! Don’t: Wait in a line all day for one museum/attraction when you could be exploring the city. (Unless you’re visiting the city for a longer period of time) Like I said, we went to a ton of museums on our program and most of them were extremely crowded with ridiculously long lines. Don’t wait in every line for every museum. I recommend picking one or two and really experiencing those, rather than blowing through all of them just to say you went! The picture to the right is of the Borghese Gallery, which was definitely one of the better ones! You buy your ticket in advance for a time slot, which regulates the amount of people that are inside at a time. It was nice seeing the pieces without being pushed over or having a blocked view the whole time. Do: Find some authentic souvenirs, not just magnets and Italian flag pasta. Rome is the center of Italy’s tourism industry. It’s a massive city, where millions visit every year from all over the world. They have countless souvenir stores and booths with the same cheap things in each one. While I bought the cliché souvenirs like some David magnets for my friends, I also made a point to buy some local art prints from street vendors and some snacks from a bakery! Don’t: Worry about not knowing Italian fluently. Italian people are awesome. We had very few negative experiences with local people in any of the cities we visited. While I think they appreciate it if you actually try to speak with them in Italian, they’re more than happy to speak with you in English if they know it. Almost everyone we encountered in Rome knew English pretty well, so we didn’t have any major communication problems and you probably won’t either! Do: Pick a cool spot and hang out for a little! My favorite spot in Rome was the Trevi Fountain. It was pretty crowded at all times of the day, but it’s so pretty and such a fun spot. There were people sitting and drinking wine, tossing coins in the fountain, playing instruments, talking with friends; just hanging out! It’s so big, intricate and old; again, it’s one of those things that make you feel small in a big world. I recommend picking a spot, just to sit and take it all in! You’re in Rome, Italy. Get some wine. Grab a snack. Enjoy it. Do: Hoard your euro coins! If this is your first time in Italy, keep your euro coins like they’re gold! Italy has a huge cash based economy and coins are scarce. Most stores and restaurants don’t usually take cards, unless it’s a large purchase. Rome was much better about having change than in some of the other Italian cities, but I wanted to point it out because I’ve seen where a cafe couldn’t (or didn’t want to) break a €5 bill for a €1 purchase. Their cash based economy can easily be adjusted to and really isn’t a big deal; I just wanted to warn any first timers! Do: Go out and experience the nightlife! Rome is a big city with a lot of young people, so the nightlife is awesome. While we were there, we went to an Irish pub (lol) that had a ton of locals inside watching a soccer game, which was cool to experience! Then, we headed over to Ice Club, a pub made entirely of ice! That was super fun, even though we were three of the five people there at 9pm on a Sunday evening. We didn’t have a ton of time before we had to catch the last metro, but you could see people pouring in and out of pubs all night! If you’re not into the party/club scene, we also went to plenty of bars (cafes) for wine and snacks for a chill night out! These are my major Do’s and Don’ts of Rome! Did I miss anything? Comment below! This May, I was fortunate enough to live in Cortona, Italy with the UGA Terry College of Business program. 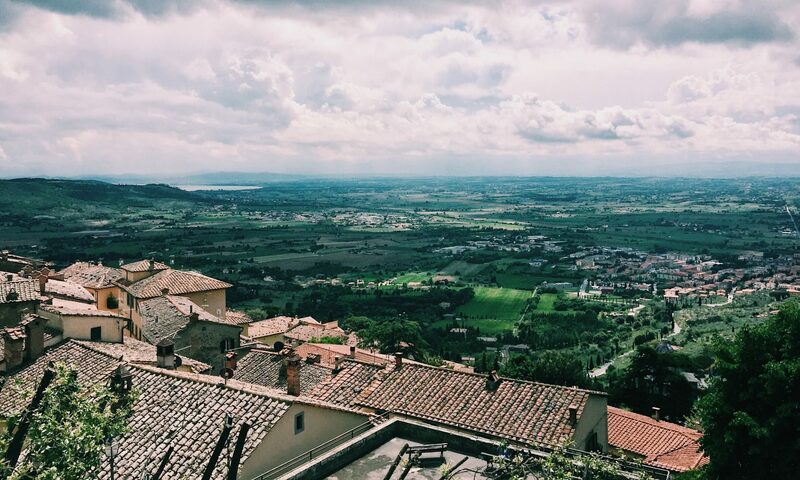 Largely known for its depiction in Under The Tuscan Sun, Cortona was the perfect way to experience small town Italian culture. UGA’s Cortona campus is a renovated monastery-turned-dorm at the top of the scenic mountain town. It was crazy how quickly it began to feel like home, almost 5,000 miles away from Georgia. Cortona is located in the farthest eastern corner of Tuscany atop a mountain. The streets and buildings are all made of stone with almost no greenery that is not in a pot, but this really adds to Cortona’s overall charm. The only flat street in town is Via Nazionale where all the shops and cafes are located. These are the cafes we would visit almost every day for a latte (only 1 euro!) and a pastry to work on our assignments. While the stone structures and streets add to the overall charm, the real charm of Cortona is its people. I honestly expected local people to not like us since we were American, but they were really patient and kind to us, as well as all tourists. UGA has had students coming to Cortona for the past 50 years, so they’re definitely used to us, but I think it helped that they knew we were genuinely there to learn about their culture. My favorite part of Cortona was its family owned, local artisan shops all around town. You could buy anything from handmade soap to custom designed clothing. While you might want to come prepared where your wallet is concerned ($$$) if you’re hoping to buy, it’s so much fun stopping in and meeting the owners and artists themselves! Riposo is basically the Italian “siesta” and it is still a very common practice in Italy. We had to wait until about 3pm to go to the cafe every day because they’d be closed from about 12:30 to 3 every single day. While I admit this definitely results in some profit loss and reduced productivity, it is genius from an employee job satisfaction standpoint. The mentality behind this practice is that employees aren’t living their entire waking life at work. This allows employees to feel as though going to work is an activity that occupies most of their day, but isn’t their whole life. They get to maybe nap, eat, or see family and friends during their break, which allows them to feel rejuvenated when they come back at 3 or 4pm until close around 7pm. When I say “marrying your employees,” I mean that it is law in Italy that an employer cannot simply just fire an employee. An employer commits to employing someone for life, unless they do something insanely terrible or illegal. Even if they are a horrible employee, an employer is required by law to give them three warnings and then, if they do not correct the behavior, they can be let go. However, the fired employee has an option to appeal this, which can cost the employer thousands of dollars in legal fees, time and energy. While I say this, it is not necessarily a bad thing in the Italian culture. While lackadaisical employees can hinder productivity, often times it’s good for a business. This practice has encouraged the Italian people to see their job as a career and not so much so a stepping stone to the next best thing. For example, it was very common for 40 year old men to be a waiter at a restaurant and they took their job very seriously. Whereas at home in the US, a waiter is usually a bored college student trying to pay some bills and student loans. Waiters in Italy were always very concerned if you did not eat all of your food because they thought you didn’t enjoy the food. The success of the restaurant directly affects their chosen career, so they want to ensure customer’s satisfaction with their experience. My favorite part of Italian culture is “aperitivo,” when everyone in town comes to the piazza around 6pm to sit, drink wine or walk around to talk to neighbors. It’s something both locals and tourists can participate in, which what I thought made this custom cool. This Huffpost article did a great job of explaining the historical significance behind it and the typical “aperitivo” food and drink. I didn’t know about Spritz before I went to Italy, but they are an Italian staple. I wasn’t a huge fan though, so I stayed with red wine most of the time! Italian’s eat very late, after aperitivo, so they usually eat around 9pm and later. The Italian culture believes eating is an activity for spending time with friends and family. In a traditional Italian dinner, there’s at least 3 courses and 5 courses is most common: antipasto, primo, secondo, contorno and dolce. I love Italian food, so it was great getting to try so many things each night. Some have asked me if we had to adjust to different portion sizes in Italy versus the “huge” American portions. Honestly, I ate way more food in Italy than I ever do at home in the US. While each portion may be small, a person gets full after 3 or more courses of carb-loaded food. If you ever have the opportunity to not only go abroad, but live abroad, do it. I cannot stress enough how amazing it was to spend a month in this amazing little town. Immersing yourself in a culture so different from your own allows you to appreciate their way of life, but also your way of life back home. While I was very happy to be home, I already miss Cortona with every part of my being and I’ll forever be an Italophile. Almost all streets were similar to this, downhill with an amazing view. The view from our restaurant! Everyone sits in the piazza with wine and talks to everyone at about 6pm every day. Only about HALF the walk up back to the dorm. Cortona was entirely made of a stone structures and stone streets. A winery in Cortona, Baracchi. Highly recommend!! The best gelato in town is at Snoopy’s! Got one of these almost every day. More to come about my travels to Rome, Florence, Pisa, Cinque Terre and Venice! I just wanted to share about beautiful Cortona first! I recently went to Nashville for the weekend and I owe our successful trip all to Pinterest! Usually, I look solely to Instagram for travel recommendations. Instagram users find the coolest and often hidden gems in cities, and then are able to share the exact location for other users to find! However, for Nashville, I found that Pinterest was a great platform for bloggers to share sample itineraries for weekend trips. Draper James: First, I am obsessed with all things Southern and Draper James is classic Southern style. Second, Reese Witherspoon has been one of my role models ever since I can remember. She’s an amazing actress and businesswoman. And third, we actually got to meet her and she was so nice. So. Nice. ACME Feed and Seed: ACME is a four story factory turned into a restaurant, bar and concert venue. This place was packed with both tourists and locals, and I definitely know why. You could easily spend your whole night in this one building. The rooftop bar had a great view of the river and city, while the ground floor had delicious drinks and food, as well as a live band. Murals: We hit a few of the most popular ones, but they are located literally all over the city. Murals are one of my favorite newer city trends. They’re art that everyone can relate to, while also livening up the area. I saw most of these on Instagram first, but some blogs from Pinterest helped me find their location! Biscuit Love: I had heard so much about this brunch place online and from friends-of-friends, so we had to try it. The “bonuts” are definitely not overrated and worth every second of the wait in line. Get there early to avoid a line around the block! The Broadway Strip: I feel like everyone should experience this at least once their life. The street is lined with huge neon signs and every bar is at least two stories high (most are three or four!). Each bar has multiple cover bands playing on each floor. We loved exploring the four floors of Honky Tonk Central, the old school car hung on the wall at Nudie’s and the party scene at The Stage. Antique Archeology: I was a History minor in college, so I’m a huge fan of the American Pickers show on the History Channel. My parents and I used to watch all day marathons on the weekends when I still lived at home. I had to include their Nashville store location on my Nashville list and I wasn’t disappointed! They had some crazy items, as well as tons of show merchandise for fans of the show. The Loveless Cafe: The Loveless was one of those things that I knew was famous, but wasn’t sure why. Every famous country music artist has been and taken a picture there. While it is actually a little bit of drive out of the city, it was definitely worth the trip. The food was amazing and it was fun to learn about it’s history in its shops during the wait. It was originally one of the few stops on Highway 100 in the 1950s and has been famous for its Southern food ever since. I love doing “Insta the travel guide” posts for two reasons. 1) I get to spread the word about how one can use social media platforms to your advantage while traveling! 2) I try to convey to the marketing world and business owners the importance of the use of social media platforms to reach certain markets. For many like me, if we can’t find your business online, we can’t find your business in person. My first blog post ever was about how I used the Instagram account, ATL Bucket List, to make the most out of my summer in the city! Now, I wanted to do a separate post about my favorite places I found through Instagram! ATL Bucket List and the Atlanta Places tag were great places to start, as well as stalking friends’ and family’s accounts! Here are my top 9 places in Atlanta! 1. Murals: I am the most stereotypical millennial and loved the murals. They are all over the city and this Instagram account tells you where they all are! My friends from school came to visit and I dragged them all over the city to see them. This particular one is in the heart of the Edgewood neighborhood and definitely my favorite of the ones we saw! 2. Jackson Street Bridge: This was by far the hardest place to find because most people don’t like tagging its exact location, but I found it! This bridge has the best cityscape view in the city (that I found so far)! Hopefully this helps someone else who had seen it pictures, but couldn’t find it! 3. High Museum of Art: I don’t live under a rock. I had heard about the High before, but the photos in the Places tag made me want to go! I wouldn’t say I am “into” art, but I loved exploring this place! 4. Chattahoochee Coffee Company: In the back of a gated apartment community, there is the cutest coffee place with the BEST view in Atlanta (ITP!) Pull up to the call box, say “Coffee!” and they’ll buzz you in! 5. Atlanta History Center: While the museum itself was very interesting, the best part is the Swan House out back and its gardens! I had seen photos of this place and had to find it. It’s absolutely gorgeous and a must-see while in Atlanta! It was once owned by the (very rich) Inman family in the 1930s. Today, it’s known for that the Hunger Games was filmed there! 6. Sweet Auburn Curb Market: Definitely one of the coolest places I’ve been! Sweet Auburn Curb Market was started in 1918 after the Great Atlanta Fire of 1917, as part of the area’s revitalization efforts. Today, you can find really affordable produce and meats, as well as shop at various food court style restaurants! I highly recommend Bell Street Burritos, a local business similar to Barberito’s and Moe’s! 7. Monday Night Brewing: Although one of the big three breweries in Atlanta, I initially found Monday Night through a friend’s Instagram and I had to go see the tie wall! While I wasn’t the hugest fan of their beer selection (I’m not a fan of really hoppy beer), it has a great atmosphere and hilarious tour guides. Tucked away in West Midtown, this a must try for a fun evening out! 8. Midtown: Midtown is an obvious must-see, but a picture with the sign in Colony Square is a must-do while in Atlanta! 9. Georgia Aquarium: This one is cheating because I interned there this summer and I didn’t find it on Instagram, but it is definitely an Atlanta must-see and their Instagram is always on point. One of my favorite things I’ve ever done was getting to take a yoga class in front of Ocean Voyager! The best thing that has ever happened to me in my life was catching this cutie’s attention and snapping this awesome picture of our staring contest! I love beluga whales. These are my top 9 spots in the city! What are your favorite spots in Atlanta? This weekend, I convinced my friends to come with me to try out Chateau Elan! (Just kidding, they were down immediately; no convincing was needed.) I found out about Chateau Elan through a friend of a friend a while ago and it went straight on my bucket list! I had done some research ahead of time on their Facebook for information and their Instagram for the unspoken dress code, so I had a pretty solid idea of what to expect and I was not disappointed! If you know anything about me, I always check social media before going somewhere. Even just photos can tell us so many things about a place! A website is what the company wants you to see; social media is what other consumers want you to see (with a little guidance from the company, of course). Chateau Elan is ensuring that all customers leave with newfound knowledge and new experiences, no matter what level of wine connoisseur you may be! We loved it and I would definitely recommend it for a girls day with friends or date night! We did the 8 tastings + the tour for $25 package. Upon arrival, they give you an informational sheet about the different wines they offer and their descriptions, as well as a pen to mark off which ones you tried. The tour lasted about 30 minutes, and I don’t think I’ve ever learned so much in 30 minutes before in my life. I really appreciated how the tour informed guests on the wine-making process, as well as the wine-tasting process for the beginners! The tour guides and bartenders are doing an amazing job of reinforcing the overall brand and its desired experience. We got a quick description of every single pour and you could tell that each one knew their stuff and really wanted you to enjoy the experience. The atmosphere was absolutely beautiful, inside and out. Overall, a great way to spend a Saturday! In any industry, the most powerful marketing tool has always been word of mouth recommendations. As consumers, we trust our friends’ opinions. If they have a great experience, we expect the same. In our social media driven society, it’s only natural that word of mouth has gone digital. Instagram has made it extremely easy to share our ideas with our friends and strangers by simply uploading a picture and a caption. It’s my go-to travel guide because I tend to like seeing the sights and experiencing the cool, local stuff instead of the tourist crazed attractions. If I’m ever in a new city, I always follow about 5-10 local Instagram accounts to find the best of the best and I haven’t been disappointed yet. My very first WordPress post was actually about my great experiences with the Atlanta Bucket List account. Most recently, I used Instagram to make the most out of my trip to Philadelphia! While we were only there for a couple days, we made the most out of the city. Start off the with the Places tag or hashtag of the city you’re in to see the most popular photo ops. We didn’t see too many unique sights this trip because my mom was not up to walking 15 miles a day, but then again, neither was I. It was too cold for this southern girl. Then, search for accounts with the city in the name. phillyfoodies and philadelphiafoodie gave us such a great recommendation for brunch near our hotel, we ate there twice! Green Eggs Cafe was amazing and I highly recommend the rosemary potatoes and the cookie dough stuffed french toast. They also led us to Federal Donuts, which is hands down one of the coolest custom donut places I’ve ever been to! We found Bar Bombon the old fashioned way (Google maps), but this place is my #1 Philly recommendation y’all. The entire restaurant is vegetarian, and you wouldn’t even know. My mom, a carnivore, said this was the best place we went to the entire trip! Highly recommend literally everything on the menu. Thanks Insta for another great trip! This summer I moved to Atlanta and interned with Georgia Aquarium (the best decision I’ve ever made and I could talk about it all day). I’m not originally from Atlanta and I didn’t know what all there was to do in the city, so I followed an Instagram account that did everything for me. ATL Bucket List highlights the trendiest and hottest spots of Atlanta. It focuses on local food and drink, but also frequently features attractions, street art and special events. The Instagram account was only created a little over a year ago in March 2015 and already has over 57,700 thousand followers (and increasing every day!). Alyssa, the account’s founder, has now expanded ATL Bucket List into a blog, Facebook Page and Twitter. Atlanta isn’t the only city to have this type of Instagram account. Nashville has a very similar account, Nashville Guru, and Chicago has an almost identical Chicago Bucket List. I’m sure there are many more cities with similar accounts that I just haven’t visited yet. If you can’t find a similar Instagram account for your city, I highly recommend starting one. Alyssa has become a major influencer in the Atlanta community in just over a year. This could have have easily been anyone! All it takes is one great idea and an Instagram account to gain a following. Through ATL Bucket List, she has gotten some exclusive VIP invites to special events, as well as free swag, from organizations like Chateau Elan and The Atlanta Beer Festival, to give away on her account.